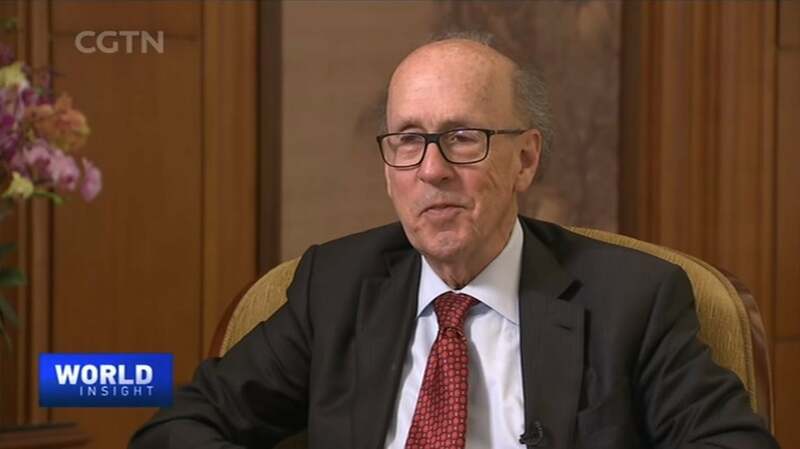 Stephen Roach On Chinese TV "U.S. Soul Searching Needed To Fix Multilateral Trade Tensions"
Professor Roach what a pleasure to see you once again in Beijing. Great to see you too. Great to see you. You've got some very convincing statistics for us illustrating the U.S. trade deficit and how it was formed. What's the reality. One thing you talk about how many countries you have trade deficit with tell us more about that. Well we have a multilateral trade problem which means we have deficits with many many countries. And it comes from our shortfall of savings when countries don't save and America doesn't save when you want to grow you import surplus savings from abroad and you run a big current account deficit to attract the capital that gives rise to this multilateral trade imbalance. We had trade deficits last year for example with 102 countries ranging from China which has the biggest one which is by far the biggest and then Germany Japan Mexico all the way down to small places. Believe it or not the Vatican's we run trade deficits with over half the countries in the world. I wonder what Vatican export to the United States. Well I joke when I talk about the Vatican I say it's part of our spiritual deficit. But you know it's it's not a particularly big item but it's just indicative of the fact that our trade deficits are pervasive. And it's a multilateral problem and the problem with U.S. trade policy right now is we're trying to find a bilateral fix for a multilateral problem and it won't work because if we don't adjust the saving rate upward if we go after one trading partner like China with a bilateral fix the Chinese peace will be spread to other countries who are higher cost producers and that will be the equivalent of a tax hike on American consumers. So it is a losing proposition. And how to solve that problem you know that is a big problem for a long time. The main factor holding back our saving. Believe it or not as our big budget deficits. So in 2000 17 at the end of the year the Congress and the Trump administration pushed through a gigantic tax cut which is lowering our savings rate even more which will create bigger problems for our trade deficit not just with China but with the other countries as well. -[inaudible]- economy is doing so well right now in the United States. Well it did well for a while but as we say the bloom is off the rose. I mean the growth rate has decelerated for four consecutive quarters in a row. This 4 percent the second quarter of 2000 18 Zelda 3 in the third quarter to in the fourth and one in the quarter is now ending. So you know it was what we call a sugar high EDS felt good it was very sweet. While we ingested it but the taste has worn off and the economy has gone back to its pre tax cut sluggishness. So you think there has to be an overall rethinking of the U.S. economic policies to begin with. You know professor that's not going to happen. Right. I think you know as we move through this period of challenging political leadership challenging economic leadership we have an adaptable flexible resilient system. And I think you know I'm hopeful that if we do get a shift in leadership that there'll be a rethinking of economic policy that will go on. Well but let's hold on a second. In the final three decades of the 20th century our domestic savings rate adjusted for depreciation which you should do to measure it correctly averaged six and a half percent. Today that number is about three. So we're operating at less than half. The longer term historic average so there's been a big shift down recent.